The technical use of sorption processes has reached an increasing importance during the last decades. The applications are widely diversified, ranging from biogas processing to medical technology or gas storage. The characterization of correspondent sorbent materials often occurs by means of gravimetrically or volumetrically methods. In addition, the detection of breakthrough curves within an adsorber column can be used to determine sorption capacity, heat of adsorption and corresponding kinetic. RuboLab offers three versions of the BTC system to measure breakthrough curves within an adsorber column. Each system contains a modular gas dosing unit to generate the different fluid flows. Afterwards the stainless steel adsorber vessels are flown through by the corresponding gas mixtures. For this purpose, the system contains two thermal mass flow controllers and a pressure regulation device. The sorption based temperature change within the adsorber bed can be detected by using three different temperature sensors. In addition, the breakthrough can be measured using a gas analyzation of the product flow. The standard version of the miniBTC instrument contains an electrical heating device which can be used for samples pretreatment as well as high temperature sorption measurements. Optionally the system can be expanded with a with a liquid bath thermostat. 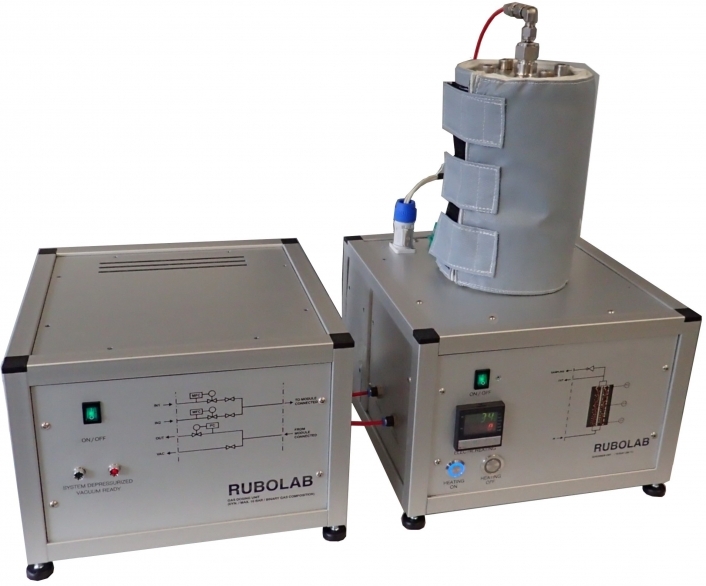 The picture on the left shows experimental results, measured by means of the RuboLab mini BTC. Sorption measurement was performed using a binary gas composition (He,CO2) and a carbon molecular sieve. The diagram shows the time-shifted temperature peaks within the adsorber column. The breakthrough is indicated by an increasing CO2 concentration within the product feed. In this example, the CO2 concentration was measured using a non-dispersive infrared sensor (NDIR). This breakthrough data offers useful information about sorption kinetic as well as heat of reaction. Moreover, the data can be used to calculate corresponding sorption capacities. BTC measurements from a He-CO2 mixture lead to CO2 capacity of sorbent material. In the diagram on the left the corresponding data is compared with a gravimetrically measured sorption isotherm. For detailed BTC or PSA studies the adsorber geometry is of special interest. For this reason the sample holder of the RuboLab mini BTC instrument can be equipped with inner containments to adjust height-diameter ratio of adsorber bed. In this context, customer specific solutions can be realized. In addition, the bed volume reduction allows the measurement of smallest sample amounts (e.g. in case of Metal-organic frameworks). The sensors used to determine fluid composition can be configured freely. By doing this, specific measuring tasks can be carried out according to customers’ specifications. The standard version of RuboLab mini BTC is combined with NDIR sensor, TCD or MS. Other options are on request. The modular design of the system also allows the independent use of the gas dosing in combination with other equipment in your laboratory. 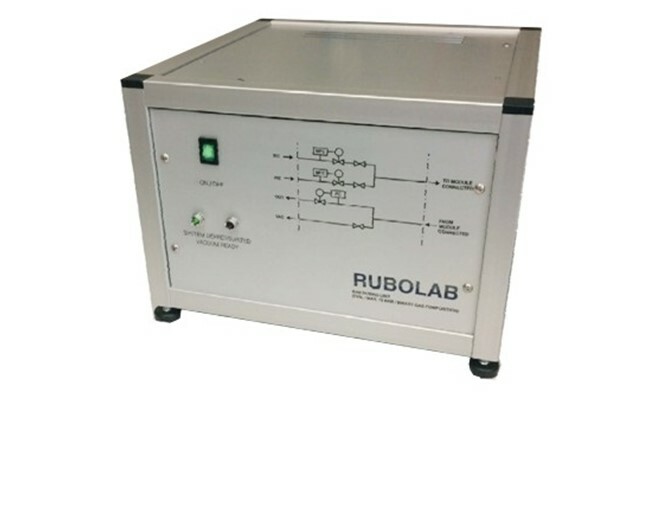 For this purpose the Rubolab software provides an independently executable software for controlling the gas dosing unit.